Joy cometh in the morning… | Janet Dahl, et al. 30 years ago, our lives changed with the news that we would be parents. Steve didn't blink, and declared it "God's will" despite his relatively agnostic ways. In 24 hours, he began issuing "fetus updates" and the culmination of these news briefs was Patrick Joliat Dahl. My own mother heard the announcement on a Detroit simulcast. She was happy about the news, but not about her place in the informational chain. Last autumn, we found that the subject of the "fetus updates" and his beautiful wife would be parents. We learned this in the conventional way. We have ridden sidecar to this exciting journey for months, counting down the weeks, and then the days until we would greet the next Dahl. I began subscribing to the App What to Expect When You are Expecting- the electronic version of the source for our fetus updates. I trace the baby's growth and development with weekly e-mails. Somewhere there is a data base which assumes that I had a baby on June 27th. The products I receive internet ads for are not really things that the Grandmother needs. Still, I cannot cut the cord, to use a maternity analogy. I just might learn something I can use to make Henry happy. In preparation to welcome the littlest Dahl, I tip-toed back through my world 30 years past. I read the letters that I wrote to Baby Pat when he was in utero, explaining how his Dad had lost his job, and that we would still figure out a way to care for him. I watched our video tour of the house, saw a very young Janet heading to the hospital, and relived some of my labor and delivery. I saw my new wriggling baby take his first breath and make his first cries. I re-read Pat's baby book, recalling the outpouring of love from Steve's audience. Most of all, I marveled at the optimism that infused this time in our life. We had lived in Chicago for fewer than 3 years when Pat arrived. Steve was on his third job. He was doing afternoons at WLS, a place where he was in constant conflict with his beleaguered boss, John Gehron. He was often suspended, repeatedly scolded. We had just bought a new home. Steve had a new car. Our dog was a chronic runaway- we could not even control a Yellow Lab. I was not finished with law school- in fact, I had exams to take the week after Pat arrived. What were we thinking? How could we have been so brave- or foolish? The answers are in our faith in our love and our durability. Perhaps we were naive, or perhaps young people are not wired to worry. It doesn't matter. When Steve lost his job and assured me that he would take care of us, I believed. When Patrick's first sobs prompted me to assure him that we would always take care of him, he believed. Somehow, this belief in love and his own future make his journey to being a father less harrowing. He believes. He has good cause, for he has chosen Rachel, whom I love as a daughter. I watch this union and marvel at their confidence and cohesion. 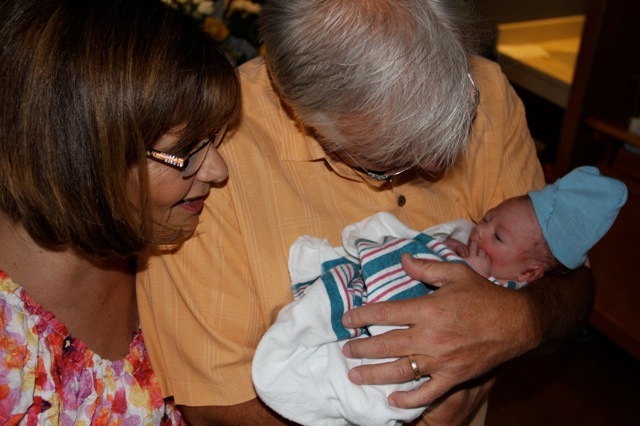 When little Henry pushed into this Brave New World, as a Grandparent I contemplated how rugged the road of life - even the childbirth that marks the starting gun- can be. Fortunately for Henry Donaldson Dahl, his parents' joy is based upon that same optimism and determination I saw in the young Steve and Janet. They are there to guide him, and smooth the bumps until he can navigate on his own. They believe in themselves. They will believe in him. He is armed for the journey. As a Grandmom for two days, I am over the moon and mildly incoherent. I will share more as my brain returns to its normal rhythm. Many, many thanks to all who have sent kind thoughts. Once again, I feel embraced by a "family" that extends far beyond blood. Life gives me gifts every day. Sometimes I stop to be grateful for popcorn, or a good book, or a clear sky. Some days the gifts are beyond comprehension. On Tuesday I went to the hospital as a wife and Mother, but I came home Wednesday a Grandmother. Steve and I stopped at the Rock and Roll McDonalds for double cheeseburgers, small fries, and toasted our great fortune. The richness of my life humbles me.